1. If you want to keep bull terrier, you should know are you really that person who can allow to keep English Bull Terrier. Don't revalue your own strength, because young, cheerful and movable English Bull Terrier can become your problem. Your desire shouldn't come from sudden mood or whim, or from thought "because another people have English Bull Terriers". Find out in details about nature and external signs of breed. Do you want English Bull Terrier simply for yourself or you want to breed it? Your final decision must come only from one thing - from love to the breed. 2. Ask dog breeders how they take care about their own pets, it's very important. Acquisition of each new pet brings a lot of happiness, but also duties. Acquisition of English Bull Terrier must equal to adoption. 3. The Breeding begins with right feeding and bringing up puppies. You, as beginner dog breeder, must keep yourself consecutively and steadily. Feeding on regime and exercises are the main condition of bringing up English Bull Terrier. It's a shame to look at English Bull Terrier in a hutch. English Bull Terrier's eyes, which has to stay in hutch, is impossible to forget. 4. Bring up your dog balanced and friendly. If you are unbalanced, don't require success from your English Bull Terrier. Every ten praising must happen not more than two blames. English Bull Terrier tries you to like him and does everything correct. Teach it to distinguish what is "right", and what is "wrong". 5. If you have a good both on nature and on exterior bull terrier, don't proud and require greater, than it can give. Don't make a slave from it, let it be your friend. There is nothing better, than to have old wise English Bull Terrier, which has possibility to improve the line of its nature. It knows each nuance of your voice and each gesture. 6. English Bull Terrier can bring to you a lot of happiness, but if it doesn't approach to its owner and to surrounding people, it can bring a lot of distresses. 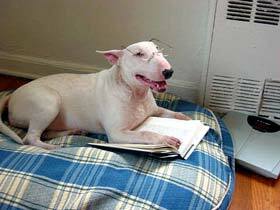 English Bull Terrier can bring benefit to many people, if it's been taught correctly. English Bull Terrier wants to do something, than simply exist, degrading as satisfied "dog for a game". Teach your English Bull Terrier to understand, not linking its initiative and not restricting its typical qualities of nature. 7. Brilliant wool - sign of correct feeding of English Bull Terrier. He doesn't need neither warm water, nor soap. Dry wool necessary to clean by brush daily. It's the best and correct care of wool. Guard your dog from draughts and chill. 8. Try to understand "language" of your English Bull Terrier. Choose time to watch at him. Soon you will see that it has something to tell you. 9. Take your English Bull Terrier at holiday with you, if it's possible. Then you will have enough time to set up contact with him and go to long walks. It is useful to you, and to your dog. Otherwise, take care of good place for your English Bull Terrier. 10. Never disillusion your English Bull Terrier. Its confidence to you will be boundless. You must praise it and seldom punish or condemn. Try to control yourself, contact with pet requires time and patience. Finally, you will make sure that you have found real friend to lifelong.